bybmg: About Me: Spring is here! About Me: Spring is here! Happy Monday! 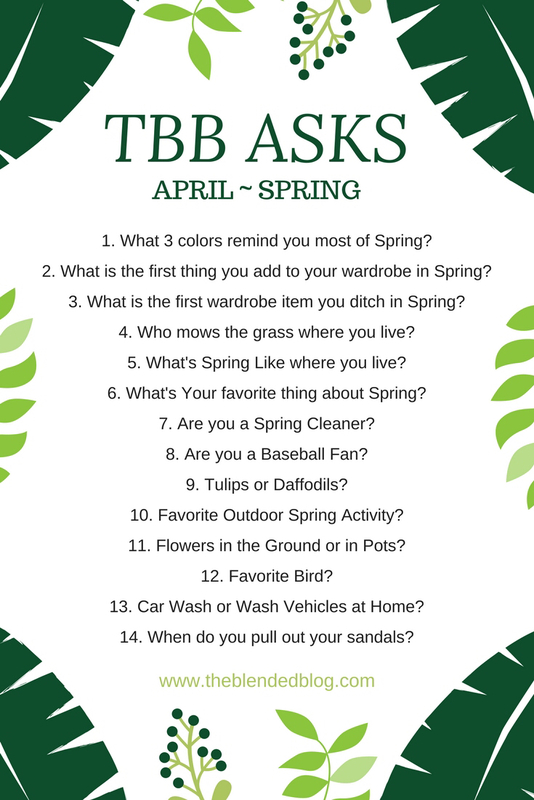 Today I'm linking up with The Blended Blog for their series TBB Asks! 1. What three colors remind me of spring? For me it would be light green, lavender, and pastel yellow. They just make me think of all the flowers and plants starting to grow. 2 and 3. What is the first thing I add/ditch to your wardrobe in Spring? Probably the first thing I add is bare legs! I have dresses, but in the winter they are worn with tights or leggings (which is what I ditch). I hate being cold, so when the weather gets warmer, I break out the bare legs with dresses. 4. Who mows the grass where I live? Russ is the mower in our family. We have a push mower and he gets a good work out trimming up the yard. I've really never mowed though I have done a little weed whipping. 5. What is spring like where I live? I live in central Iowa and it can really depend. In the last few weeks it has started off cold and felt more like winter most days. We're kind of hovering around highs in the 40s or 50s which is not warm enough for me. If it could get into the 60s that would be nice. Hopefully soon! 6. What is my favorite thing about spring? I love seeing everything come back to life. I also like that the kids can get back outside and play. The other morning, Henry wanted to go swing outside before school. He swang away in his winter coat. I can tell that kid is missing nice weather as much as me! 7. Am I a spring cleaner? No. I'm really not a cleaner. My house isn't filthy, but it's also not spotless. I don't have a regular cleaning schedule and I'm sure that appalls some people but I think there are bigger things in life than worrying about cleaning. I clean as needed, usually in 30 minute spurts before company is coming over. 8. Am I a baseball fan? I do enjoy baseball. We don't really watch a ton on TV, but I enjoy going to a game every now and again. Each year we usually pick up a Groupon pack of general admission tickets to our local Iowa Cubs and hit up a few games with the boys. 9. Tulips or Daffodils? I really just like flowers in general. 11. Flowers in the ground or pots? I usually have a few pots of flowers on our front porch! 12. Favorite bird? I don't really have a favorite bird, but I think that cardinals are fun because of their red color. 13. Car wash or wash vehicles at home? If you follow my Instagram story, you know I like the car wash. Our car dealership gives us a car wash coupon after an oil change and even without the free coupon I go there because they have a pretty cheap car wash! 14. When do I pull out the sandals? I usually pull them out when it is above 60 degree and I have painted my toe nails! Which reminds me, I need a pedicure! Are you excited for spring? Do we have anything in common?